This is the most comprehensive tome on contemporary art in Vietnam today. It is a page-turner for any art lover but it also appeals to the traveller. Vietnam has developed in every way over the past decade. The world has access to its culture, food and landscape, along with its traditional art. 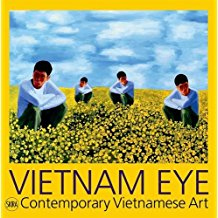 But Vietnam also has an evident and thriving contemporary art community and much of the work of those artists appears in this superb book, Vietnam Eye – Contemporary Vietnamese Art. There have been more than half a dozen other volumes in the “Eye” series, covering Malaysia, Hong Kong, Korea, Indonesia, Singapore and Thailand, and this one is dedicated to dozens of emerging Vietnamese artists. The book is edited by Serenella Ciclitira and published by SKIRA. Alongside detailed information on each artist is an in-depth look at Vietnam’s burgeoning and popular art scene. This is an essential book on the fresh art of Vietnam. It will appeal to artists of every genre but also to those who have visited this remarkable country. There is so much between these pages that is both beautiful and thought-provoking. I love the sensitivity of the realist art of Tran Van Thuc. These life-like models of old women speak volumes on the passage of time and the aging human condition. Le Thuy presents silk painting of outstanding quality: the ‘Order’ series is subtle and beautiful. Le Vu offers humour in the guise of instant noodles posing as a bed – a full-size bed! Vietnam Eye – Contemporary Vietnamese Art is a joy. It’s sumptuous and disturbing in equal measure. It presents stories on bright canvases. It looks at Vietnam through the eyes of the Vietnamese. It begs the viewer to ask questions. It touches on tradition and innovation – and displays local materials and techniques along with those from the west. Editor Serenella Ciclitira has an honours degree in art history from Trinity College, Dublin and has worked extensively with artists and galleries throughout the world.